Add some exotic charm to your home with this unique high back dining chair. Hand-woven from natural abaca leaves over a beautiful mahogany frame, this rustic dining chair brings a bit of the outdoors into your dining room. The durable materials and solid construction keep this chair looking great for years of everyday use. Really loved these chairs! 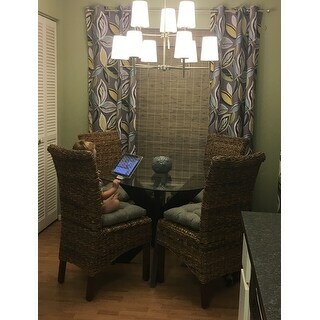 Totally transformed my dining room. Really sturdy and beautiful. I put chair ties on it as well as cushions. Love it!!!! Beautiful everyone who comes in comments on what a great piece this is. Chair arrived fully assembled. I saw these chairs and loved them. I got a fantastic deal on these, we have a similar brand where I work that are *** a chair. I like how these are not too bulky and the color is rich. I noticed they wobbled at first but that was a quick fix. The shipping was insanely fast. I got them 4 days after I placed the order. I thought they were flawed when I got them but realized it was just pieces of paper or cardboard on the chair. I took a soft damp cloth and wiped it off. I am satisfied with my purchase. Beautiful chair! Looks exactly like the picture. Arrived in perfect condition. Love the looks of these chairs but they are not very durable. Already peeling in spots. This is everything and more of what I expected. Well Built, Nice Look! Great chairs. Was looking for a while for some similar but could never find any I liked for a reasonable price until I found them on here. Very sturdy. Solidly built chairs that come assembled. Matched my space perfectly. Excellent price in comparison to ******* ***** and even ******! They are perfect for what I wanted them for; plus they are quite sturdy. They're a little rough on the skin, but I figured that before I bought them. One of them arrived somewhat damaged but it isn't that noticeable. They came very quickly, and I am happy for that. Love it. Very well made. Is just perfect for my desk! I have bought other woven and wicker chairs before from overstock but this one is my least favourite. Close match to my dining room chairs. "Where can I find cushions for these chairs that tie across the back?" We recommend searching through 20-ich seat cushions. "WHAT IS THE SEAT HEIGHT FOR THIS PRODUCT?" Thank you for your question, jh. 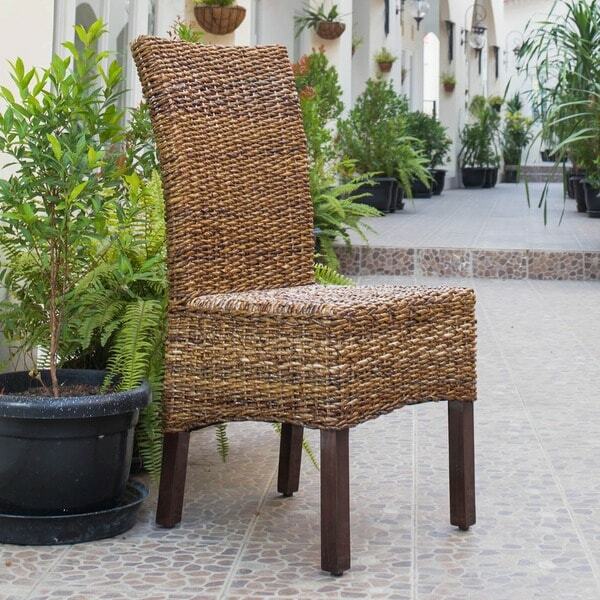 The seat height for the International Caravan 'Arizona' Woven Abaca Chair with Mahogany Hardwood Frame, from the floor to the top of the seat is approximately 19 inches. Have a great day.